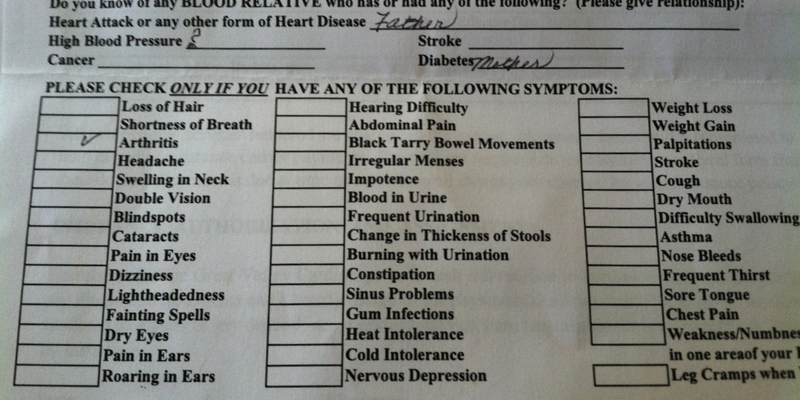 Do you have to fill out one of these when you go see your doc? How many items do you check? This list belongs to a wonderful woman named Joan who happens to be the mom of one of my good friends. Although I think having only one item to check would be good anytime, the fact that Joan is 80 years old is pretty impressive! Joan watches what she eats, is very active keeping up with her children and grandchildren and can often be found with her big gloves on going through recycled metal with her daughter who is a metal artist. Now, really, isn’t that they way we all want to be when we are 80? It’s never too late to create a healthier life!